Charles Marquis Warren | 50 Westerns From The 50s. 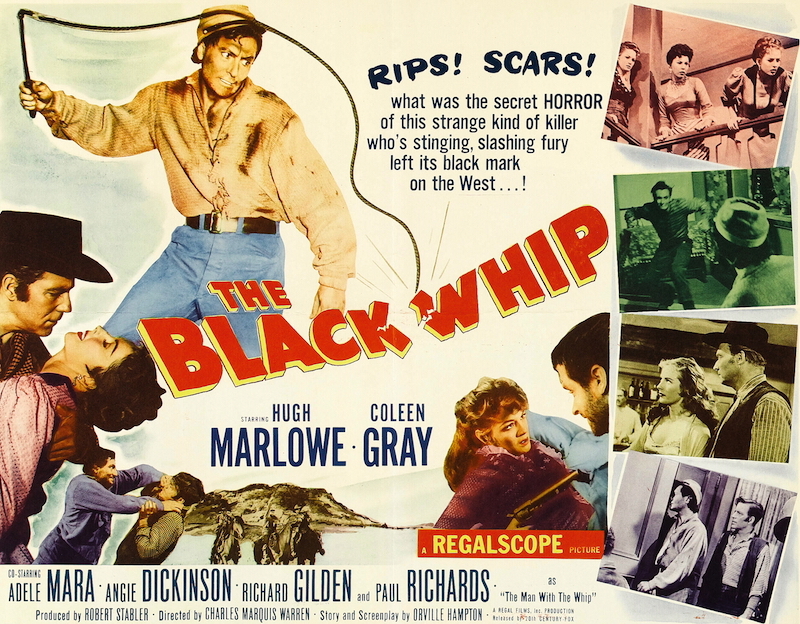 50s Westerns DVD News #216: The Black Whip (1956). There’s been a lot of buzz around here lately about The Hollywood Scrapheap, a “salvage operation for Hollywood’s most neglected movies.” Their selection is terrific, and reports of the quality have been encouraging. I was excited to learn they have The Black Whip (1956)— a Regalscope picture from Charles Marquis Warren, shot by Joseph Biroc — listed among their upcoming releases. They’re promising a chance to see its full Regalscope framing. Can’t wait! DVD News #171: Seven Angry Men (1955). How can Seven Angry Men (1955) miss? 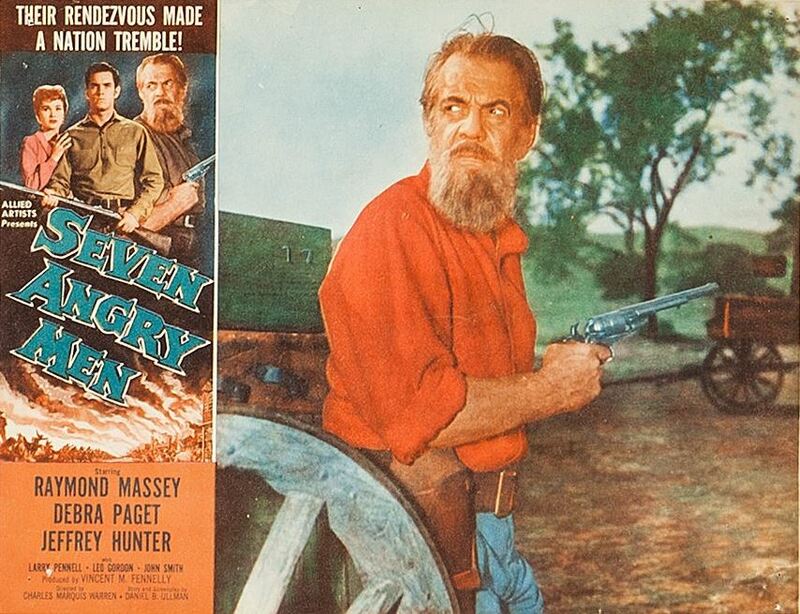 Raymond Massey plays abolitionist John Brown (a role he’d already tackled on stage and in Santa Fe Trail). It was written by Daniel Ullman, who wrote a number of William Elliott’s Allied Artists pictures, among other things. 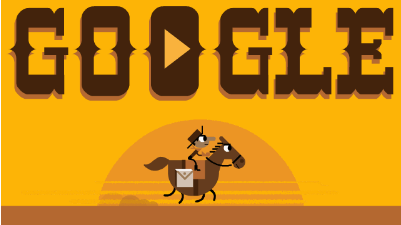 It’s directed by Charles Marquis Warren, the same year he helped bring Gunsmoke to TV. 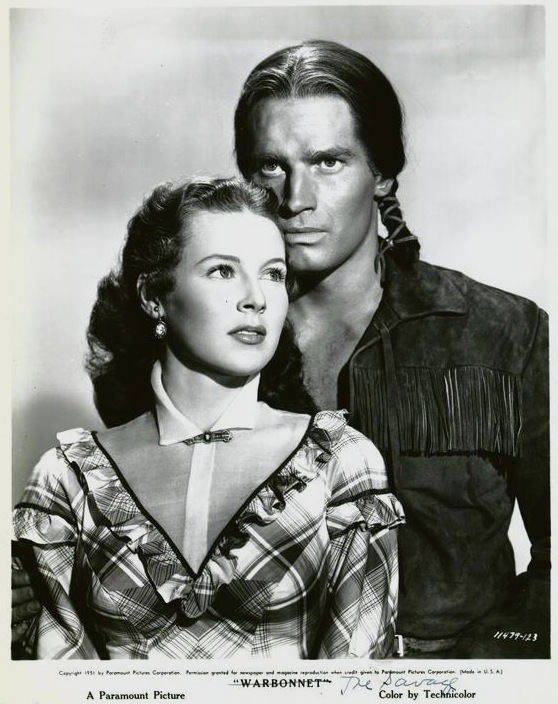 And it’s got a supporting cast that includes Debra Paget, Jeffrey Hunter, Leo Gordon and a pre-Zorro Guy Williams. 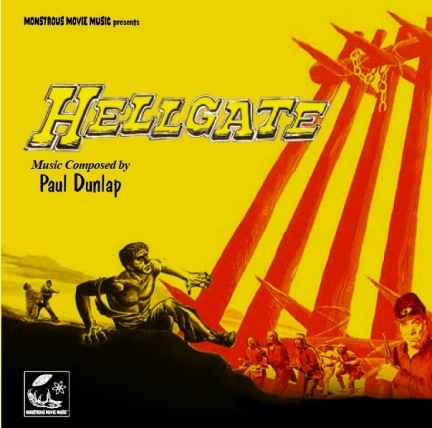 It’s probably a lousy history lesson, but a great addition to the Allied Artists stuff available from Warner Archive. And it’s coming at the end of March. Thanks for the tip, John. 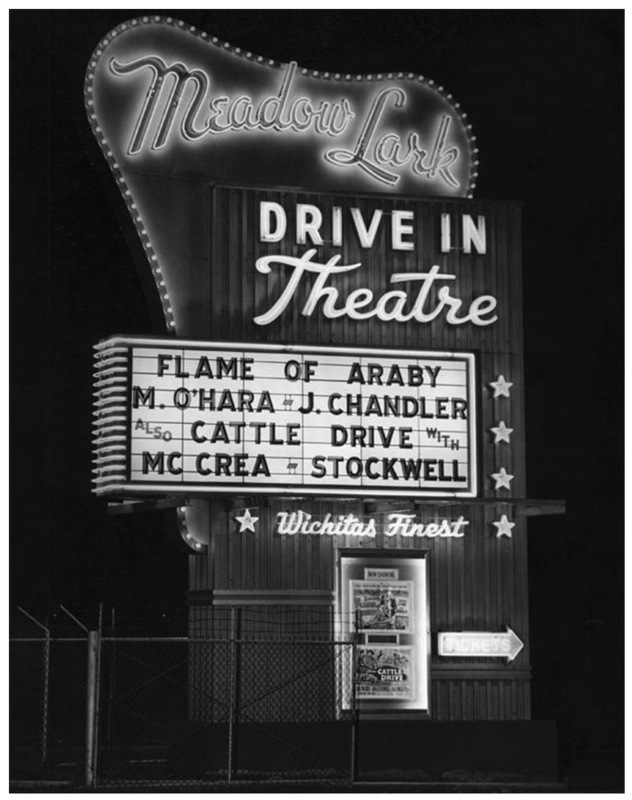 TCM Alert: McCrea In May. Turner Classic Movies is handing Wednesdays to Joel McCrea all through May. And they’re offering up some really good stuff. There’s great pictures like Sullivan’s Travels (1941) and Foreign Correspondent (1940), lots of ’em. 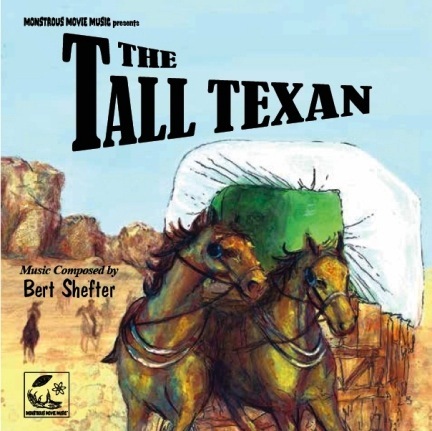 And there’s a heavy helping of Westerns, too. 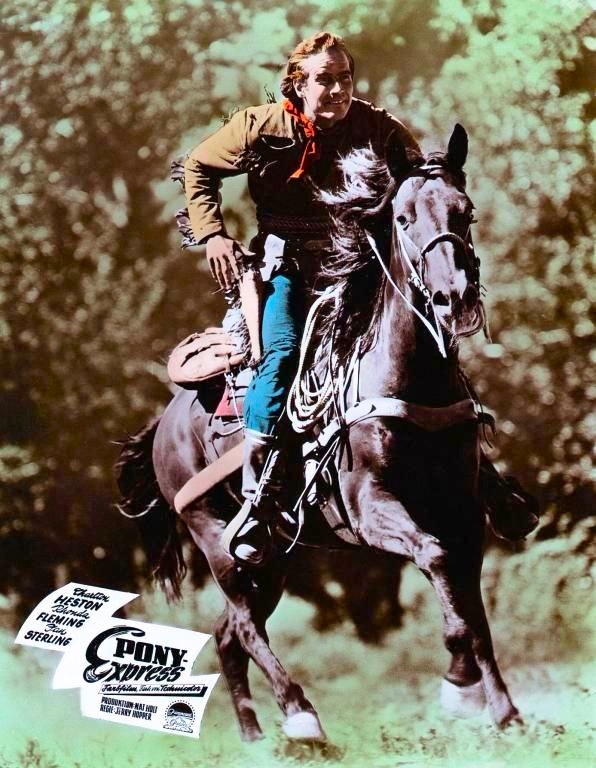 The 50s Westerns scheduled are: Stars In My Crown (1950), which is not really a Western, but that’s OK; The Outriders (1950), which has a great part for James Whitmore; The Tall Stranger (1957), a hard-to-find ‘Scope Louis L’Amour adaptation co-starring Virginia Mayo and Michael Pate; Fort Massacre (1958), with McCrea knocking an Ethan Edwards-type role out of the park; Trooper Hook (1957) which co-stars Barbara Stanwyck; and two of McCrea’s Universal Westerns, Frenchie (1950) and Cattle Drive (1951). You’ll find the full details here. I can’t think of an actor more deserving of this kind of attention. 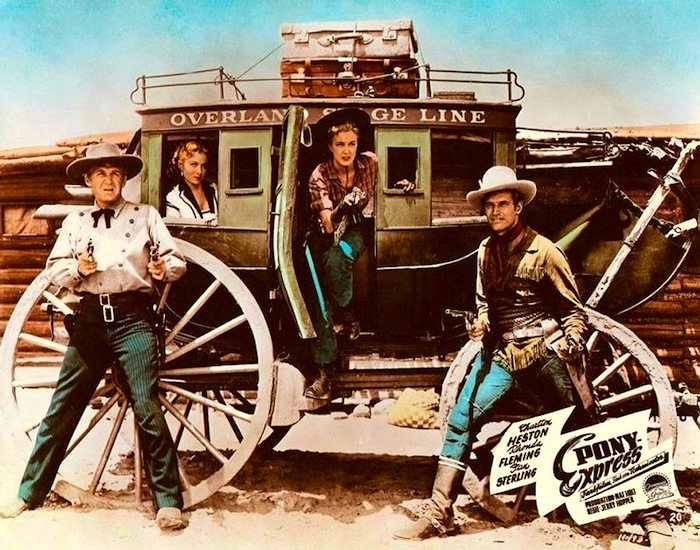 50s Westerns DVD News #64: Olive Films. The onslaught on new releases continues, which is great news, with a batch of Paramount titles on the way from Olive Films — including a number of 50s Westerns (in addition to Nicholas Ray’s Run For Cover, which I covered in a previous post). Silver City (1951): Byron Kaskin directs Edmond O’Brien, Yvonne De Carlo, Richard Arlen, Barry Fitzgerald, Gladys George and John Dierkes. The Savage (1952): Directed by George Marshall. Charlton Heston stars. There was a bit of controversy over the title, with The Savage being switched out with Warbonnet (see below). Denver And Rio Grande (1952): Byron Haskin and Edmond O’Brien again, this time with Sterling Hayden, Dean Jagger, J. Carrol Naish and Zasu Pitts in tow. Gorgeous Technicolor location work — and Hayden, as always, is cool. 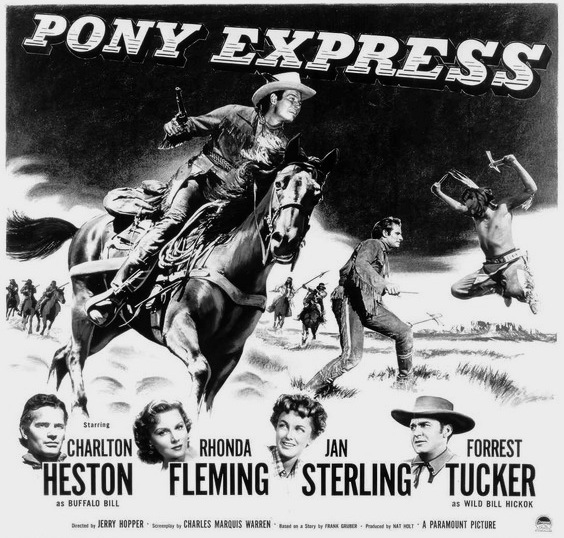 Pony Express (1953): Charlton Heston is Buffalo Bill. Forrest Tucker is Wild Bill Hickock. Rhonda Fleming and Jan Sterling are in it. It’s written by Charles Marquis Warren . What more do I need to say? The Hangman (1959): I’m dying to see this one again! Robert Taylor, Tina Louise, Fess Parker and Jack Lord make up a terrific cast. Directed by the great Michael Curtiz. Jack Lord was on a roll in this period — Man Of The West (1958), God’s Little Acre (1958) and Williamsburg: The Story Of A Patriot, the VistaVision short subject that has run continuously at the Colonial Williamsburg visitor center since 1957. 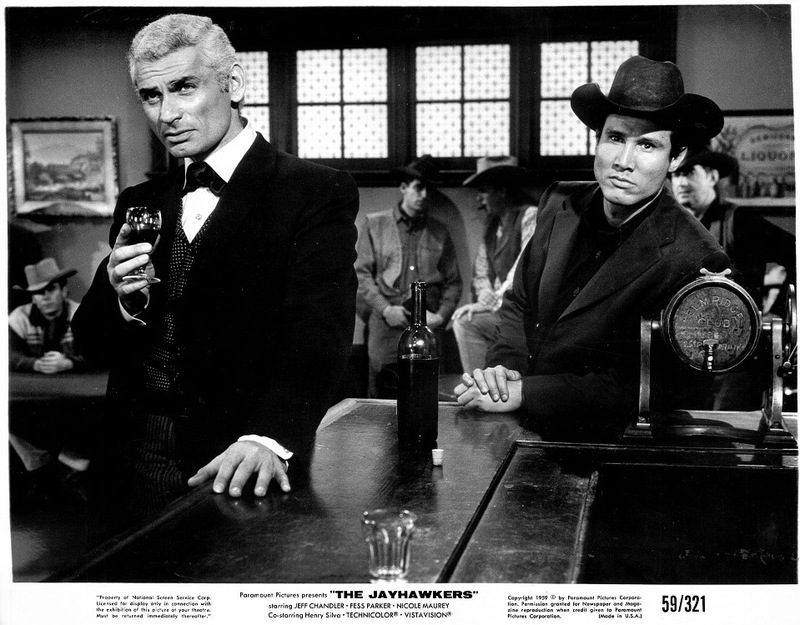 The Jayhawkers (1959): Jeff Chandler, Fess Parker and Henry Silva star in this picture, which holds up much better as a Western than as a history lesson about pre-Civil War Kansas. 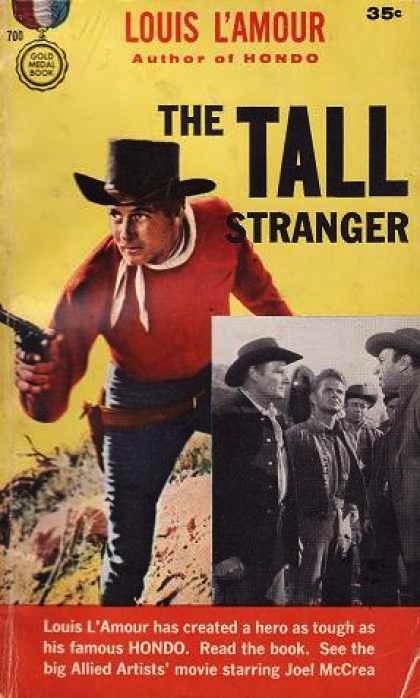 Henry Silva is in a lot of good 50s Westerns — The Tall T (1957), The Bravados (1958) and The Law And Jake Wade (1958), yet we don’t really associate him with the genre. It also features a terrific score by Jerome Moross.